The 17th Gyalwa Karmapa, Thinley Thaye Dorje, was born in 1983 in the Year of the Pig. He is the first-born of the 3rd Mipham Rinpoche of the Nyingmapa School of Buddhism. The 17th Karmapa’s father is the third reincarnation of the 1st Mipham Rinpoche, the head of 13 Nyingma monasteries in Kham, Tibet, and a descendant from many generations of doctors and learned medical scholars. His mother, Dechen Wangmo, is the daughter of a noble family descended from King Gaesar of Ling. In his youth the 3rd Mipham Rinpoche escaped the fate that befell many Tibetan people unable to practice their religion under Chinese communist rule. His teacher found a hiding place in the mountains where they were able to practice the Dharma continuously ever since his early childhood. In 1982, after a general relaxation of government restrictions on religious practice, Mipham Rinpoche went to Lhasa to take part in the reconstruction of Buddhist institutions and practice. Due to his good connection with the Panchen Lama, his activities were particularly successful. In the early 1980s, Mipham Rinpoche’s yidam (a personal deity in Vajrayana Buddhism) predicted to him that if he took a consort that he would produce several sons who would be great bodhisattvas. The next day a group of pilgrims from Kham arrived to see him; among them was Dechen Wangmo. He realized that she was humble and gentle and an accomplished Chakrasambhara practitioner. When he proposed marriage, she immediately accepted. As man and wife, Mipham Rinpoche and Dechen Wangmo settled in an apartment rented from an old lady in the Bakor area of Lhasa on the same street that circled three-quarters around the famous Jokhang Temple. A son was born in wedlock in the year 1983. At the age of two and a half, the little boy started to tell people that he was the Karmapa. The landlady happened to be a distant relative of the late 16th Karmapa and had met him before he escaped from Tibet in 1959. He told her once, “Before you die, you will meet me again.” Due to the exceptional behavior of the boy, she was convinced that he was the Karmapa himself. Out of strong devotion, she offered the use of her apartment to the family for free. However, Mipham Rinpoche remained silent about his son while hoping that he might turn out to be the reincarnation of the great Nyingma master Katog Situ Rinpoche. One day in early 1985, when Ngorpa Lagen, a humble old Sakya lama, was circumambulating the Jokhang Temple in the circular street, he noticed the gleaming white face of a little boy peering out of the window of a private house. Drawn by curiosity, he walked towards the window, and the little boy said, “Don’t you know that I am the Karmapa?” Without pondering the seriousness behind these simple words, Ngorpa Lagen replied, “If you are, then give me a blessing.” The boy stretched out his arm and touched the lama. According to the lama, he instantly felt something akin to the post-meditative experience of deep calm and expansiveness that prevails over all forms of gross emotions. A few days after this blessing, the Sakya lama, together with a group of pilgrims who had arrived from his homeland, went to Mipham Rinpoche for a prediction as to where their next pilgrimage should be. He noticed the little boy who previously had blessed him playing in a corner by himself. Mipham Rinpoche asked the group of visitors how many families they were. When they answered, “seven,” the little boy rang out from the corner and said, “Eight!” All of them were obliged to count again. When they realized that the boy was right, the lama reported that his hair stood on end and that his shock and excitement were so great that it was difficult to hide his reaction completely. Further along his pilgrimage in late 1985, Ngorpa Lagen went to Kathmandu, Nepal, and joined a large annual prayer and recitation gathering led by Lama Sherab Rinpoche, a disciple of the late Karmapa. The two soon became acquainted, and Ngorpa Lagen began telling Lama Sherab Rinpoche about his encounter with the little boy in Bakor. After this, Lama Sherab Rinpoche and his attendant Chopel Zangpo left for the Tsurphu Monastery but first stopped to visit Mipham Rinpoche in Lhasa. The boy was not with his father when they arrived, so Lama Sherab Rinpoche asked if he could nevertheless see the boy. When he was brought in, he sat next to his father quietly, but from time to time would eye the guests and smile with obvious amusement. When Lama Sherab Rinpoche inquired about the wife of Mipham Rinpoche, he replied she was doing a Chakrasambhara retreat. During the course of the conversation, Lama Sherab Rinpoche reported that he started to tremble and was unable to stop. As soon as they left, his attendant immediately told him that something very strange had happened to him while they were talking, which was exactly what Lama Sherab Rinpoche himself had felt. The above story was first recounted to me in 1987 by Lama Sherab Rinpoche. The circumstances of the story matched those of an earlier report brought to me from Lhasa. In October 1986, Chobje Tri Rinpoche had alerted me about Mipham Rinpoche’s son and showed me a photograph of the young boy. Between late 1981 and 1984, Tai Situ Rinpoche, Kongtrul Rinpoche, Gyaltseb Rinpoche and I – the committee of regents established by the late Karmapa’s General Secretary Dhamcho Yongdu to find the reincarnated Karmapa – held several meetings to coordinate our efforts to recognize the Karmapa’s reincarnation. Although Dhamcho Yongdu did not have the authority to create such a group of regents, I initially followed along to be polite. Soon however, I felt that these meetings increasingly became politicized; resolutions were never acted on as the three other committee members had promised. Instead, other courses of action were pursued without notice to the full committee. I was left with no choice but to act independently, but quietly, in my capacity as the Shamarpa, while inside the committee I did my best to win the other Rinpoches to my point of view. After all, by long-standing practice, it is Shamarpas who are empowered to identify and recognize reincarnated Karmapas. In 1988 I undertook my own independent investigations to determine the authenticity of the Mipham Rinpoche’s son as the Karmapa. First I asked Tsechu Rinpoche who visited Tibet as part of a Nepalese government delegation to obtain more information about the young boy during his visit. Next I sent a lama to go to Lhasa to investigate the boy more directly. Immediately upon their first meeting, the boy told the lama that he had been sent to investigate him. The results of all these reports and investigations prompted me in July 1988 to go into a long retreat when I confirmed that the boy was indeed the reincarnated 17th Karmapa. In spite of my personal conviction about the identity of the Karmapa, the time still had not come to make a formal declaration. However, in early 1991, at the inauguration of the Karma Kagyu monastery built by Shangpa Rinpoche at Phokhara which was attended by Dhazang Rinpoche, Shachu Rinpoche and hundreds of lamas plus more than four thousand Tibetans, I announced: 1) Tibet probably would be the country of the Karmapa’s next reincarnation; 2) The supplication to the 16th Karmapa for his early rebirth should be changed to supplication to the 17th Karmapa for his long life; 3) The name of the 17th Karmapa that I had decided on was Thaye Dorje. The obvious conclusion to be drawn from this announcement was that I had in effect confirmed the reincarnation of the 17th Karmapa. Karma Pakshi, the 2nd Karmapa, in his esoteric works (sangwei namthar) called Dugpa Tsarchod predicted the rebirths of 21 Karmapas and gave or predicted the name of each rebirth. The name of the 18th Karmapa is Thaye Dorje. However, the 5th Karmapa also predicted, “My lineage weakens, at the time of the 16th or 17th Karmapa.” On the surface Karma Pakshi’s prediction seems inconsistent with my recognition and naming of the 17th Karmapa as Thaye Dorje. The apparent inconsistency can be readily explained, though. As is well known, the reincarnation of the 14th Karmapa only lived for three years and was never enthroned; so official protocol does not count the fifteenth rebirth as the 15th Karmapa. Thus, it follows that the sixteenth rebirth of the Karmapa becomes the 15th Karmapa upon enthronement and so forth. 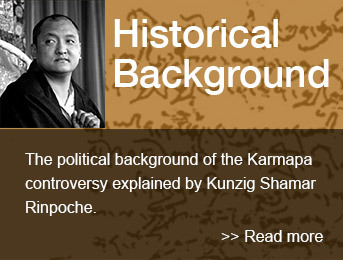 In other words, the predictions of Karma Pakshi and the 5th Karmapa are not ambiguous but actually correct. The 5th Karmapa’s prediction of the weakening of the lineage at the time of the 16th or 17th Karmapas actually refers to the discrepancy between the number of rebirths and the number of enthronements caused by the early death of the fifteenth reincarnation. Karma Pakshi’s predicted bestowal of the name Thaye Dorje for the 18th Karmapa is actually correct since the 17th Karmapa to be enthroned is the 18th by rebirth. My announcement at Pokhara no doubt caused much excitement but also provoked many comments. It also stimulated Lama Sherab Rinpoche to come to me immediately in Kathmandu and show me a poem written on a piece of paper. A very hold saint named Lobpon Kunzang Rinpoche, who had already passed away before 1991, had given the paper to Lama Sherab Rinpoche in 1983 in strict confidence on one of his many visits to Lobpon Kunzang Rinpoche’s retreat in the Rinag mountains in Sikkim. The exact literary origin of the poem is still being ascertained. According to Sherab Gyaltsen Rinpoche, the spiritual leader of the Manang tribal community of Nepal, Lobpon Kunzang Rinpoche said there are two possible sources. One is the old text called The Treasures of Yogi Zilon Lingpa (Zilon Lingpa belonged to the Nyingma School of Buddhism). The other possible source for the poem is the late Dudjom Rinpoche when he was performing a special Guru Padmasambhara puja in Kalimpong in the 1960’s. Before the official announcement of the recognition of the 17th Karmapa Thaye Dorje could be made, Tai Situ Rinpoche and his party tried to discredit me and to undermine the credibility of my identification of the 17th Karmapa. He took many illegal and spiritually corrupt steps that as far as our Karma Kagyu tradition is concerned, are completely dishonorable, indeed traitorous. He and his followers even went to the extreme of violently attacking the Rumtek Monastery in Sikkim in August 1993, and through mob action forcibly evicting the late Karmapa’s monks from the monastery. Immediately after the Karmapa Thaye Dorje and his family managed to escape from Tibet to Nepal in March 1994, the young Karmapa came to New Delhi where during a welcome ceremony I formally recognized him as the 17th Karmapa. In November 1996, he joined the monkhood by receiving refuge vows from Buddha in a large ceremony at the Buddha Gaya Temple. He then was give the name Thinley (meaning, Buddha activity) Thaye (limitless) Dorje (unchanging). As should be clear from this account, my identification and recognition of the 17th Karmapa Thinley Thaye Dorje proceeded according to many centuries of Karma Kagyu tradition. The process was completely spiritual and not corrupted by political motives. The same unfortunately cannot be said of Tai Situ Rinpoche and his followers. In a separate document I shall set forth his illegitimate actions and disprove his accusations.